Many of us have probably heard mention of probiotics, most likely in relation to ourselves. But did you know probiotics can be a huge bonus for your dog as well? And did you know that there is not just the “after”, but the “before” supplement as well? Prebiotics are usually some sort of specialized plant fiber and their purpose is simple. While probiotics introduce the good bacteria to your dog’s gut, the prebiotics nourish them. Probiotics are usually the more advertised option, and are an amazing addition to any pet’s diet. But, hand-in-hand, these two supplements work together to create a healthy and well-functioning gut biome. There are many positives of your dog having a flourishing gut biome. For one, their poop will be more regular, less stinky, and considerably more solid. No one likes dealing with a dog with diarrhea. There are other considerations to think about though. For example, as we have mentioned before, dogs are not susceptible to dangerous pathogens like E-coli and salmonella. This is because dogs have an extremely strong gut, and they destroy these pathogens before they can wreak any havoc. It is important to know that the majority (up to 80%) of your dog’s immune system is based in his digestive tract. That means that an upset tummy doesn’t mean only diarrhea and vomiting, it can mean sickness and lethargy and many other symptoms. In a healthy dog’s tummy, there should be around 100 trillion microorganisms from hundreds of different species. A variety of environmental and genetic factors can cause these numbers to drop though. If you notice your dog starting to have issues with an upset stomach, carefully consider their environment and notice if anything different has been introduced. This could be a good time to introduce a probiotic supplement, to help boost their gut biome back to full health. Though, if your dog is having severe chronic diarrhea and cannot keep food down, you should see a vet immediately, as this can be a sign of many severe issues. If it is either chronic diarrhea or just a small spout of upset tummy issues, my personal favorite solution is at the Yuppy Puppy. It is a probiotic called Healthy Essentials. It comes in a spray form and apparently tastes like liver, so the dogs go crazy for it. The real reason it is my favorite is because of how the company creates it. They use a slow-processing method that ensures the most active probiotic are harvested and used in their sprays. Actually, they are one of the first probiotics to include 11 active strains with over 975,000 viable probiotic colonies per milliliter. My own dog, Murphy, has struggled with chronic diarrhea since I got him, and this spray is the only one that made any difference at all. We do have several other options though, which any of us would be glad to talk about more with you. Another very important time to consider probiotics is after the use of antibiotics. Sometimes you just cannot avoid having to give your dogs antibiotic, for whatever reason. The sad truth though is that antibiotics indiscriminately kill both good and bad gut bacteria. What this means, is if you have a particularly sensitive dog, you will most likely notice soon after the antibiotics begin. They may vomit, have diarrhea, lose weight, or something else of the like. Though your dog may have a stronger gut and not show the obvious symptoms, a weak gut leads to a weak immune system. And that in turn leads to increased sickness and other disorders. If you use probiotics during and after your dog is treated with antibiotics, it should help relieve the negative symptoms and bring their gut back to full health. Although, it is never harmful to continue supplementing probiotics, just as we humans could use an extra gut boost. Now to go more into detail about prebiotics. So, as a reminder, prebiotics are some sort of food matter that remains undigested as it reaches the gut biome. Usually in some plant matter form. The goal of this is to provide nutrition for the healthy gut bacteria present. The one opposing argument to this is; isn’t it going to be feeding the bad bacteria as well? Most likely. That is why having probiotics in combination with prebiotics is the key. 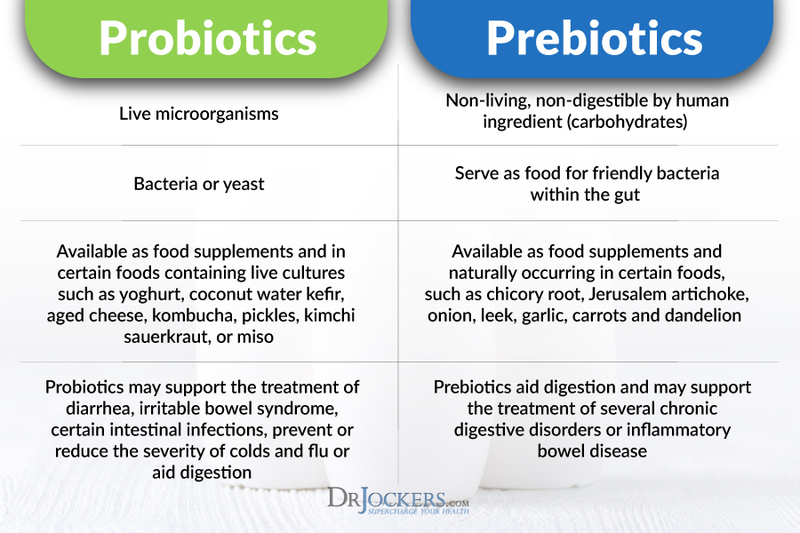 And if you have to choose one or the other, probiotics would probably be the more beneficial option, especially to start. There will most likely always be some number of bad bacteria present in your dog’s gut, but as long as the good outweighs the bad, your dog will remain healthy and happy. A common source of prebiotics is fructooligosaccharides (FOS). These are short fructose chains. But to give you the non-scientific definition, these are a type of carbohydrate naturally occurring in a variety of plants. Such as, garlic, leeks, asparagus, and bananas. Please do not feed any of these things to your pet without veterinary consultation, though, because several of these things can be poisonous in high amounts. The most important factor of these FOSs is that they are non-digestible and can move through the gut to feed your pup’s healthy bacteria. If you’re looking to try out some prebiotics, come on in here at the Yuppy Puppy. Or, if you have any further questions, please give us a call or come in and have a chat with us. As you know now, there are several key differences between probiotics and prebiotics. I would venture to say that probiotics would be more beneficial if you had to pick between the two. The most effective route, though, would be a combination of both, ensuring your dog loses nasty bacteria, gains good bacteria, and keeps the good bacteria. These factors will combine to create a healthy, happy puppy with a strengthened immune system, steady stomach, and hopefully less gas! Come talk to us anytime to learn more about our specific pro- and prebiotics!